Did you know that Thermos is celebrating 60 years of licensed lunch kits? The first ever licensed thermos lunch kit was the Roy Rogers Lunch Box! In celebration, Thermos released several new licensed lunch kit which are now available at Target, Walmart and Toys R Us! Thermos sent us their Superman Man of Steel lunchbox and Superman hydration bottle so we could be part of 60 years of licensed lunch kits! Needless to say my kids were ecstatic! The lunch kit is soft and...well...super cool! My boys cannot wait to use it! It is as always insulated and has a padded handle. It is durable, easy to clean and made out of 100% PVC free PEVA lining! The 12 oz hydration bottle is BPA-free, impact resistant (which Mom wouldn't love that? ), and dishwasher proof! It has a leak-proof lid with straw, is ergonomically shaped and has a flip up carrying loop which comes in handy when you are toting more then one or have kids that love attaching everything to their backpack (like mine;). Our sandwich box and hydration bottle fit perfectly inside the lunch kit with extra room for an ice pack and Lunchbox Love Card (how perfect is this one?). Our hydration bottle is filled with ice water. Here the lunch kit is pictured with an EasyLunchbox. 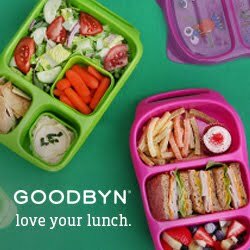 Overall, this is a great lunch kit! I really love how easy the lunch kit is to clean and that the hydration bottle is both dishwasher safe and impact resistant! A must when you have boys! Plus, if I know that they love their lunchbox I know they will take care of it and it will last us all school year and longer! The links above contain affiliate links. Very cool! I will have to look through the superhero selection.